I went down to Adelaide Thursday afternoon as I had to be at the Adelaide Airport at 6am Friday morning to pick one of our sons and his girlfriend up, who were arriving back from a week's holiday in Bali. The had a great time...couldn't spend all of their holiday money as everything was sooo cheap!! I stayed with one of my sisters who has been attending art classes in recent times. I went along with her on Thursday night as an observer and had so much fun. There are only 7 in the class, and they get on really well together. Their tutor who is very talented and has a great sense of humour, casually roams around to them, giving gentle instruction and assistance with whatever project and medium they are working on. Bronny is doing pastels. Here is a pic of her at work. This is her first pastel that she had framed - a lilly pad. We picked it up from the framers just before class so she could show everyone. It's not a good photo as I've got the light reflecting badly but you can get the idea, it looks very lifelike. Bronny was so excited about having her first picture framed she brought along Champers and nibbles, so I played waitress!!! I'm not usually a champagne person but I really liked this one, it was called Jansz Premium Curve...yum! Chocolate Crackles with a twist! 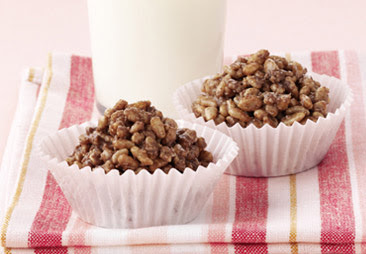 You've all probably made Chocolate Crackles, they are so easy, kids love them and they are great for fetes and parties. This is usually how they look, placed in patty pans. My mum always did hers a bit different and so I've always done them that way too and that is by adding Pascall Marshmallows to the mix and placing the mixture into a slice container, so they are then cut into square pieces. For those that don't have this recipe here it is. In a large bowl combine rice bubbles, icing sugar, coconut, cocoa and marshmallows (you can cut them up if you wish, but I use them whole) . Melt copha in a small saucepan over medium heat. When completely melted, pour over the dry ingredients. Mix well, ensuring all ingredients are covered with copha. Spread into a large slice container and set in the fridge. When set cut into pieces. These are my father-in-laws favourites, so I always make a batch and take down to them when we visit. Mmmm....a whole weekend ahead of me...what am I going to do....haven't decided yet!! Hope yours is a fun and productive one. Wow! I just love what your sister has done. I think I would love to do something like that in a friendly environment. I didn't need to see those choc crackles when I'm hungry. Hope your w'end is super duper.